Cute Cat Posters – Bounce Sales & Marketing Ltd.
Give your walls some added cuteness by ordering a bright and colourful A3 poster of Peek-a-boo Little Cat! and Little Dog! Perfect for attracting pet lovers. The peep-through window Peek-a-boo Little Cat! book will give children the chance to see what Cat can spy with his little eyes. As they turn the pages they will discover the cute animal characters that are hiding in every window. Delicate touch and feel textures that are cut into the story board pages add to the sensory storytime fun. 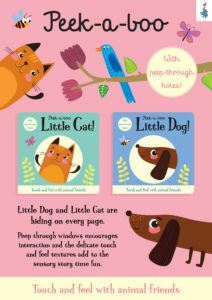 With its partner book Peek-a-boo Little Dog! also containing engaging illustrations and clear text, these books will delight time and time again.